Youth Videoconferencing style programs are offered through Connect2Texas. Each program is 45 minutes long, designed for grades 1-6, Science TEKS aligned, and FREE to join. Click the links below, or visit Connect2Texas (www.connect2texas.net) to register (registration for a program can only take place through Connect2Texas). Interactive spots still available for some programs, but sign up fast as they are limited. Urban Animal Encounters - Prickly Porcupines! Join us and our prickly guest as we clear up some common misconceptions and discuss porcupines' amazing adaptations. These rodents are unique in so many ways, from being nocturnal to being covered in quills; our program will be packed with fun facts. We will also study porcupine structures, their functions, habitats, and compare new world and old world porcupines. Don't miss this great opportunity to see this rarely seen critter! The perception of opossums is (hopefully) changing with their animated counterparts becoming more popular, especially in movies! Virginia opossums may be the most unique North American mammal, but perception tends to overshadow their awesome traits. Opossums are awesome because of their adaptations, which allow them to live in a nocturnal environment, their unique marsupial structures, and their ability to play dead, just to name a few. We will also clear up any myths and misconceptions that you and your students have about this awesome animal. Please join us and our critter guest star! September 22 (Tu) - Urban Animal Encounters: Awesome Opossums - Registration Deadline Sept. 15th! Unfortunately for our guests, their creepy appearance strikes fear in most people, even though they know little about them, and in some cases have never encountered them. Our visitors are quite an eclectic bunch, from those with no limbs, to others with four, six, or even eight! Join us as we take an up-close look at these critters and discuss how they fit into the food chain, as well as their habitats, adaptations, and the structures that bring fear to many. This interactive presentation provides students the opportunity to investigate the relationship between the anatomy and the ecology, including the dietary habits, of different species of bats. This is an experience you will not want to miss. LIVE bats take part in the program! We will look at their unique body structures and their functions that allow bats to fly, identify other special adaptations, as well as discuss their basic needs and diverse habitats. We will also discuss ways you can help these beneficial creatures and conserve their habitats. This interactive presentation opens students' eyes to the various facets of water in the environment, from raindrops to aquifers. Students will be challenged to think about where water comes from, how it got there, where it ends up, and how it is being used. Students will have the opportunity to take part in a hands-on, comparative demonstration along with the presenter, to help them better understand water usage and to learn how to conserve this natural resource. Birds of prey, also known as raptors, are a common sight in the skies. During the program, we will take an up-close look at a live Red-Tailed Hawk to discuss the important body structures and their functions. We will investigate the hawk's diet, their role in the food web, the habitats in which they are found, and the adaptations that allow them to be such powerful predators. Let's Talk Turkey!This interactive presentation introduces students to fun facts about one of our state's most fabulous birds: THE WILD TURKEY! We will discuss turkey anatomy, habitat, adaptations, and basic needs, as well as the various "calls" or vocalizations that turkeys use to communicate in their environment. 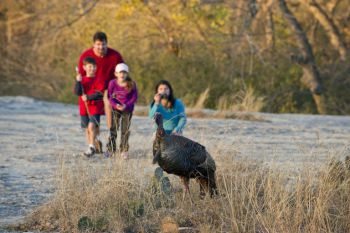 Students will listen to an assortment of calls and have the opportunity to take an up-close look at a real Wild Turkey. This interactive presentation allows students the opportunity to investigate skulls of native Texas animals. Unique adaptations will be discussed and students will be asked to identify common structures of animal skulls and then determine their function(s). During the investigations, students will discover the feeding habits, survival adaptations, and finally the identity of our mystery specimens. Visit our website for more details about Youth On-demand Webinars and Youth Videoconferencing programs.